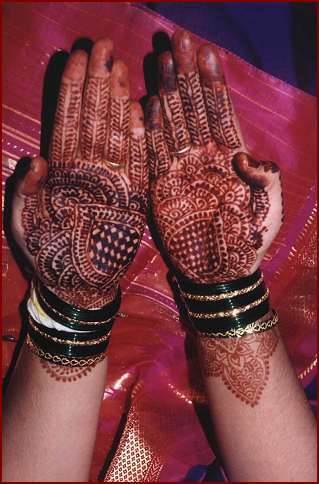 The brides hands were decorated with designs drawn in verbal juice called 'mehendi'. It is done by girls on all festive occasions. Many elaborate different pattern can be drawn and it is considered a skill. The designs are also drawn on feet. It does not have any religious meaning. The designs last for nearly a fortnight.